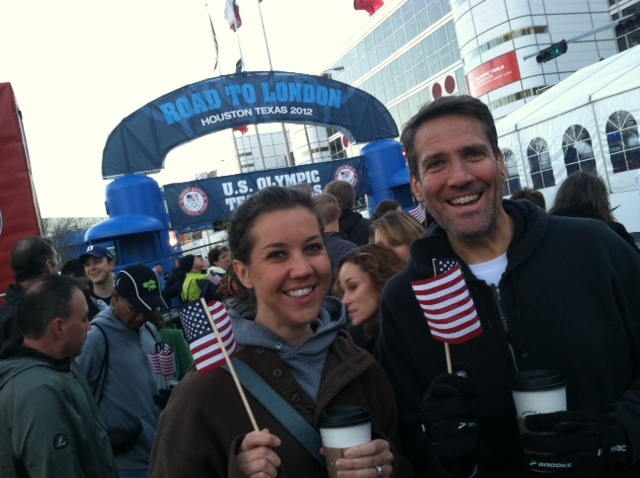 Yesterday, I was privileged to be in Houston to watch the Olympic Trials for the Marathon. Wow. What a morning. I had never really been to a running event like this before. It was amazing. I was pulling for Ryan Hall, Josh Cox and Deena Kastor, the three runners whose names I was most familiar with. I learned about some of the other runners while there. This marathon stuff is still kind of new to me. One of the things I like the best about was simply witnessing running up close. We were at times only a couple of feet from the runners while they were on the course. It was great to be able to watch their form and see the expressions on their faces and to cheer them on. It was a blast to cheer for them and wave American flags and be proud of them as they prepare to represent our country in this awesome event. I took away a few other observations as I reflected on the experience. (1) The marathon is a long distance. It’s an event to run 26.2 miles, no matter who you are. (2) Give it all and never give up. It was apparent by only a few miles into the race that the majority of the field was hopelessly behind. As the gap widened early in the race, I thought about how it feels to know so quickly that you have no chance. These runners continued the race as if none of that mattered. They kept giving and going with nothing to gain except a finish. Well, that and a really good marathon time. Just not a good enough time. This really moved me and inspired me. (3) Women run smart. It was really cool to see the women start out a little slower and gain speed with strategy. 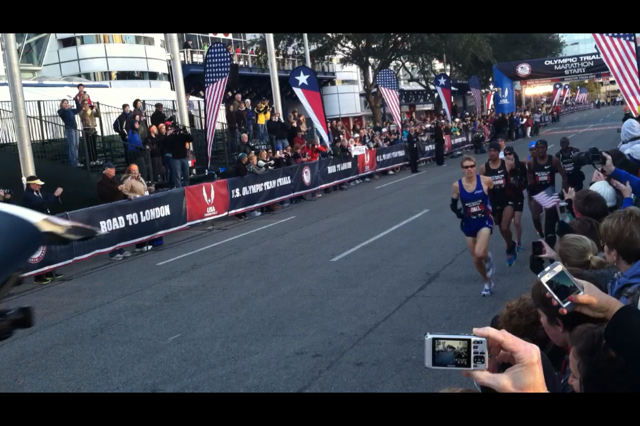 It’s also fun to watch the men out of the gate, but not as fun to watch them try to maintain that insane pace. It’s all good, though. (4) I have something in common with these people. There is no comparison between runners like me and runners like these folks, of course. But it was really cool to realize that the event I was was watching is an event I have participated in. That at least establishes a strong connection to it. It made me want to run more. To train harder. To become a better runner. It was awesome to see these champions show us how it is done. (5) I love the running community. I have found the running community to be mostly accepting and encouraging. Yesterday felt like we were all on a big team – Team USA. As I have participated in marathon running, I have found the participants to be very encouraging. People pull for each other and celebrate achievements together. I love it. I am more eager than ever to watch the Olympics this year and cheer on these and other amazing athletes. I’m so glad I was able to make this trip and witness such greatness. That’s my daughter Clayre who talked me into signing up for a marathon and who invited me along on this trip. I am watching NBC’s “The Biggest Loser” this season. It’s been a while. Back in 2007 and 2008, when I was at my heaviest, my ex-wife and two of my children would watch this show. It thoroughly annoyed me. They seemed really caught up in it, and I just didn’t get it. Looking back on that experience now, I realize that the show was a constant reminder of my overweight and out of shape condition, and that is why it annoyed me so much. Sometime in 2008, I finally summoned up the courage to change my lifestyle toward something more healthy. This was different than previous attempts to lose weight. Yeah, I was the yo yo dieter, and I had been up and down significantly several times over the past 20 years. More on that to come in subsequent posts – it isn’t the point here. I changed my diet slowly, but I also started going to the gym and working out on the elliptical trainer. Things slowly began to change. Then in the Fall, our five drivers / four cars situation left me stranded at home every day. I worked from home, so this wasn’t necessarily a problem – except – it became my excuse to no longer go to the gym for workouts. I lived about eight tenths of a mile from the gym. Certainly within walking distance. And so, I started walking. That is when everything really began to change. I started walking three to six miles per day in addition to the elliptical. And the weight started coming off. I began to feel better. I would walk at nearly every opportunity. 15 minutes at a time or an hour at a time. I also started watching “The Biggest Loser” with my family. I kept walking. Soon, an idea came to me. Why not try to “run?” I tried to surrender this idea back to its source quickly, because I didn’t like running. It hurt. It killed my shins. It made me breathe hard. I hated it. That very night was Biggest Loser night. And guess what I saw? They got those people up out of bed and told them that they were going to run a half marathon. I was shocked. And annoyed. But this time, I was also motivated. The next morning, I got out of bed and made a decision. I decided to run for 15 minutes away from my house, turn around, and run back. And it didn’t hurt that much. And then I got in the car and drove it to see how far it was. And it was 2.5 miles. And that’s when I started running. And that was over 100 pounds ago. And four marathons and a half marathon, some 5K’s and a 10K ago. I love “The Biggest Loser” because it proved to me once and for all that my mind was really the only obstacle between my unhealth and my improving health. The difference in my hating and loving “The Biggest Loser” was the way I thought about it. After a multi-season break, I’m back at it, watching and pulling for the contestants, getting involved in their stories and remembering where I came from and where I’m going. I need the inspiration as a part of completing more of my goals. Five marathons this year. Strength training. Winning the ever-present food battle. And learning to help others on their journeys. In 2011, I completed three marathons. That makes four total. I feel great about that. I am planning on five marathons, and six if I am really lucky. Three of the five are relatively local to me (Cowtown, Oklahoma City and White Rock). Two involve travel (San Francisco and Chicago). I’m going to start registering for New York this year. Maybe by miracle I will get to do it this year. This year’s overall goal will be to continue to run with good endurance while bringing down my overall time. I have the patience, will and determination to do this. And with God’s help, I will do so. Here is to an activity-filled 2012!